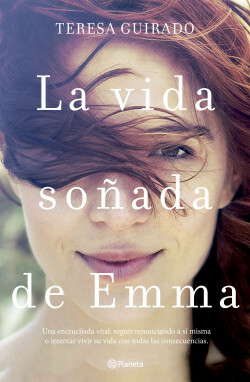 Emma is 34, married to Tomás, the mother of Julia and Marcos and an assistant in her husband’s legal studio. Apart from that, Emma has no idea who she is, only that she’s always late. The routine of her exhausting life has swallowed her whole. Her only treat is going out every now and again with her life-long friend Javi. With him, she feels like another person and can relax, chat and laugh freely. These moments of happiness almost make up for all the rest. But this balance falls apart when Javi tells her that he’s fallen in love and has to move away. The blow is too painful. Now she feels more alone than ever. Knowing that she needs to act to save herself from going under, she forces herself to look back on her life, ask questions and gain a better understanding of what she wants. She must get out of her bubble and deal with the consequences, come what may. Teresa Guirado enchants us with skilful, flowing and very visual prose in an evocative story that offers a brave, realistic and simple portrait of a woman’s emotional maturity.